Home / Blog / Inspiration / What’s At the Top of City Home Improvement Benefits? More Light! What’s At the Top of City Home Improvement Benefits? More Light! Top of the benefits people hope to achieve by undertaking home improvements – more light and as a result, increased wellbeing. There’s no doubt all of us understand the connection between more light and feeling good! When it comes to letting in the light, most of us look first to existing windows – replacing old ones and/or increasing the size of vertical windows often seems like a good place to start. But are vertical windows your only option? What about rooflights and when it comes to achieving that goal of more light and increased wellbeing, how do rooflights compare? More light makes rooms look bigger. This in itself creates a feeling of more space which not only enhances our personal wellbeing, but enhances our property as well. But when it comes to our wellbeing – extra light translates into our bodies producing more serotonin. Not only do we feel good, we sleep better too and thus set up a continuing positive cycle which builds on itself. It is estimated that the surface of an average older style home in an inner city location is comprised of just 12% glass. When you think about it it’s no wonder so many people feel their homes are dark and gloomy – and all the more so in winter. Kitchens especially if they double as dining rooms or for those who work from home, a home office too, can feel especially dull even in summer if the weather is overcast. 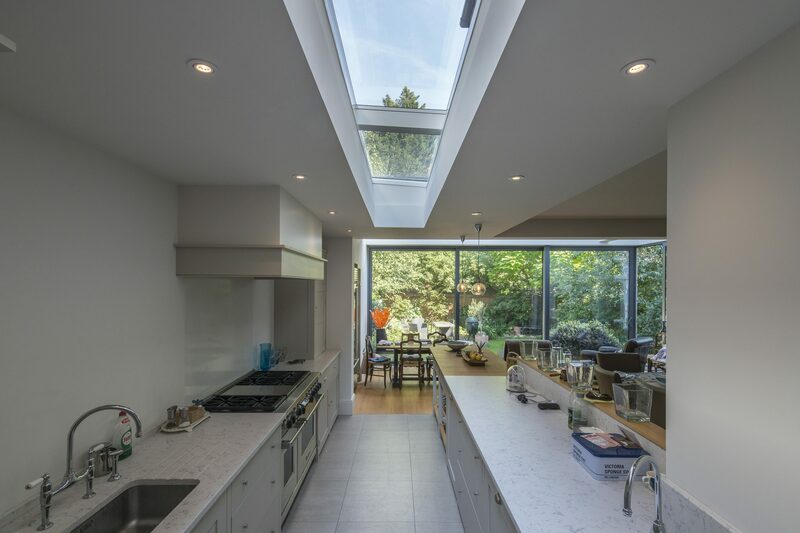 But the kitchen is an area which often lends itself best to rooflight installation due to the kitchen being a single storey extension in many houses. A rooflight – whether flat or lantern, lets in six times the amount of daylight than an ordinary window. So, a rooflight does not necessarily have to be large to have a big impact when it comes to letting the light into your home. Of course, country properties have around the same ratio of windows-to-wall surface as inner city homes and can benefit equally from rooflight installation. But the impact a rooflight has may be even more dramatic if you do live in the city, as surrounding buildings can restrict the light and street lighting often means that there is no proper range between daylight and night – especially if your home has rooms that daylight finds hard to penetrate. The result of this on our wellbeing – especially during the winter months when we spend more time indoors, is that because there is no real difference between day and night, our bodies become confused, and we find we need it to be pitch dark to sleep – whereas if we live in the light we need less dark to sleep more easily. Have a think back over previous winters or even how you get to sleep now and see if this applies to you. No matter whether increased wellbeing or sleeping better is on your list, there’s no doubt more light is the number one reason for wanting to improve our homes. How often when we think about redecorating do we find ourselves choosing colours that will make the room look ‘brighter’ or ‘lighter’? Rooflights accomplish this in one easy step for maximum results. Browse our rooflight collection of high-specification, ready-to-install rooflights and explore our case studies gallery of bespoke options for more ideas. Unsure what size or style of rooflight you need? Call us for an obligation-free chat. We’re always happy to discuss the lighter side of home improvement – from the rooflight down.